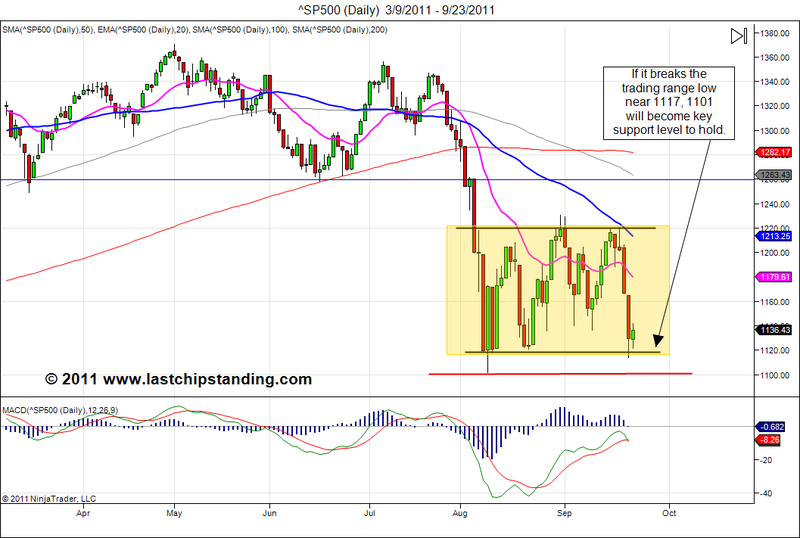 Last week, the SP500 went from the top of the trading range to the bottom of the trading range, a move of more than 100 points. At the same time, the gold and silver market also took a dive. Gold drop more than $175 and silver loss more than $10. 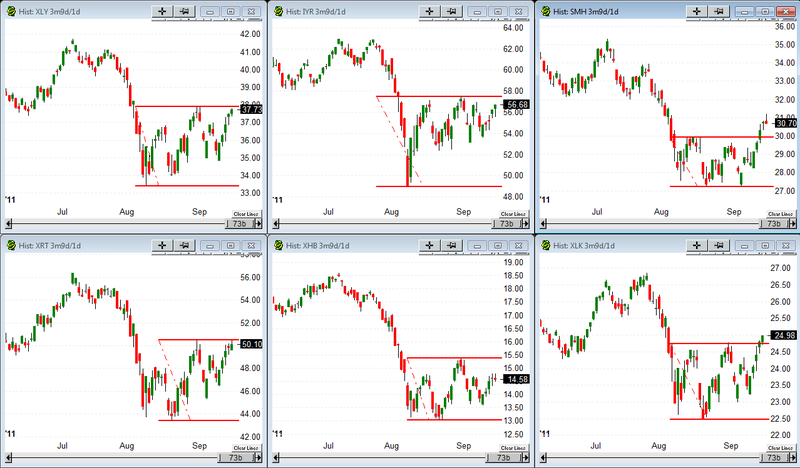 These moves could be a precursor to an extended downward move. In the coming week, the key thing to watch is will the SP500 bounce back to the top of the trading range near the 1220 or will it break below the lower range and dip below the 8/9/2011 low of 1101.54. 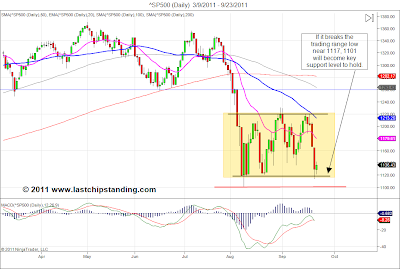 If the SP500 fails to hold above 1101, then a new downward move will take this index to the 1040 level. Gold could also get a bounce. 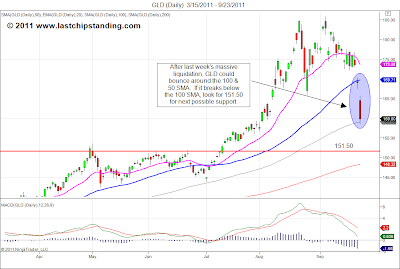 Looking at the gold ETF, GLD could get a bounce between the 50 & 100 SMA. The key level to monitor is the 100 SMA. 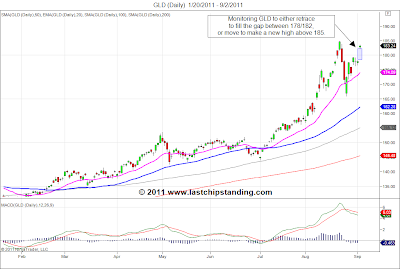 If it breaks below the 100 SMA, look for next likely support near 151.50. 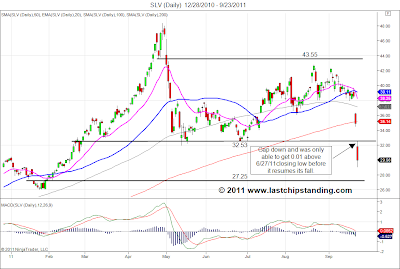 Silver ETF, SLV next likely support level is near 27.25. 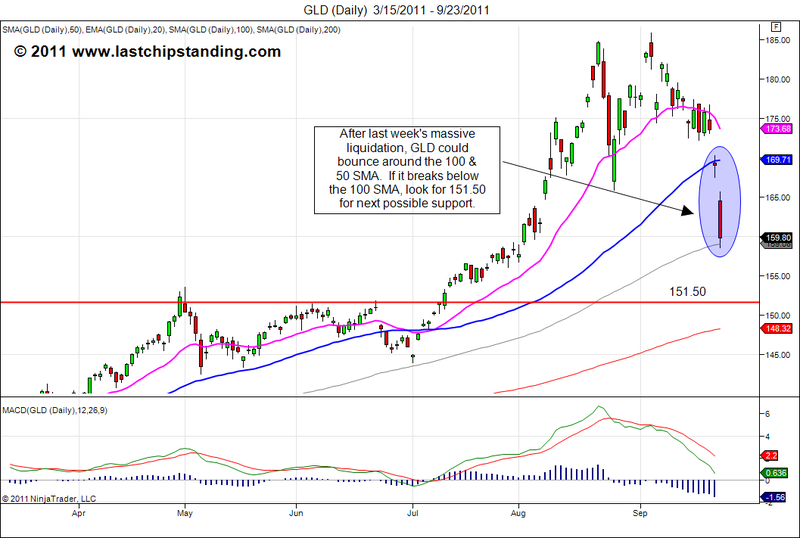 It broke below the previous support level near 32.50 and made a feeble attempt to try to get back above it without any success. All three markets had a down week and a dead cat bounce from these markets next week will not be surprising. 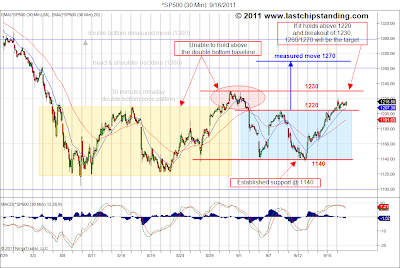 But the trend remains to be down, and the current environment is most suitable for the day/short term traders. 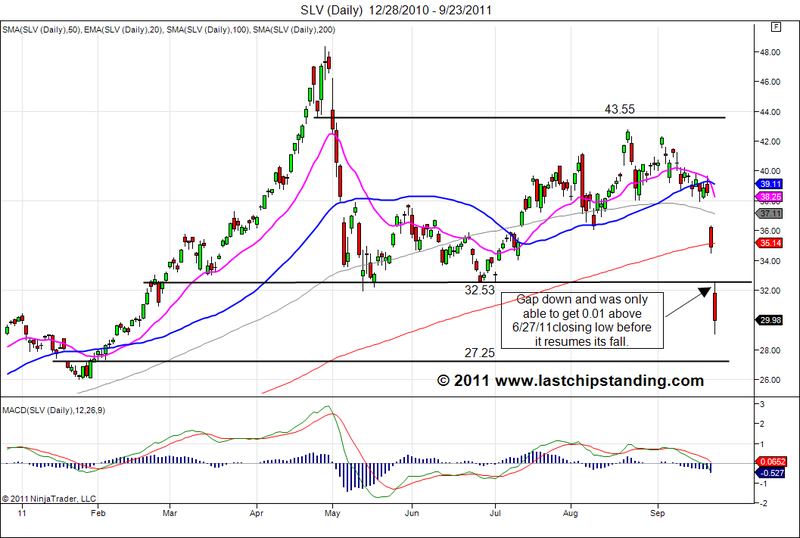 Disclosure: No position in GLD, SLV. 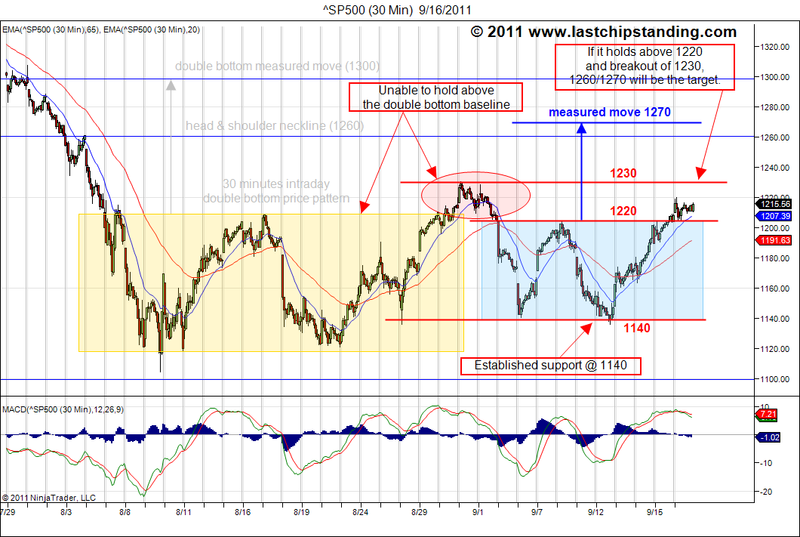 Here is the updated SP500 30 minutes intraday chart. 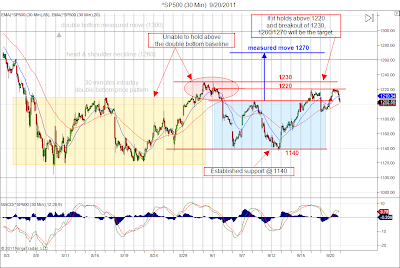 The SP500 bump against the 1220 resistance today and reversed. Key level for the bulls to defend tomorrow is the 5 days EMA near 1200. 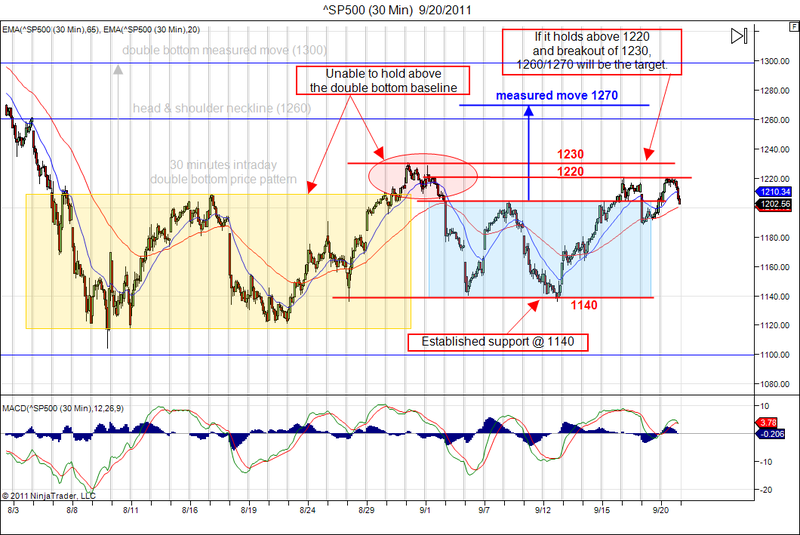 The 30 minutes intraday chart of the SP500 depicts how it has been trading within the 1120-1220 range since the beginning of August. 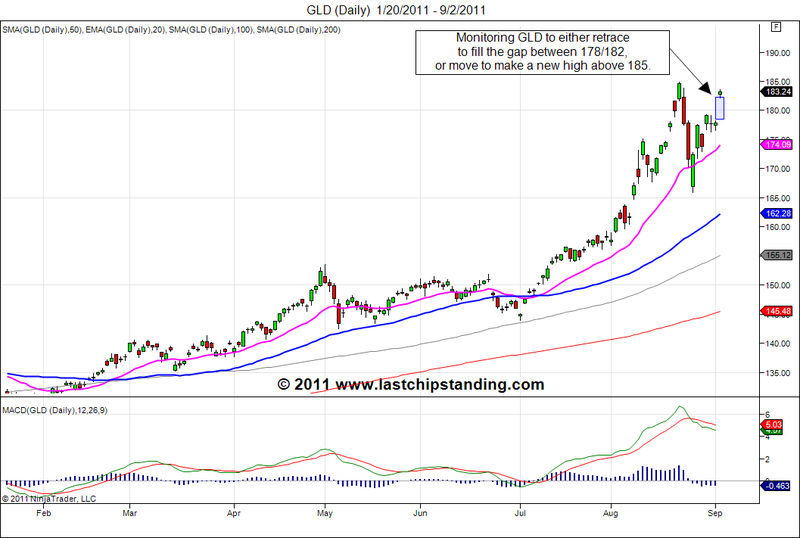 It formed a double bottom pattern in August and it was unable to break out of this pattern. After the failed breakout, the bears pushed it back down to the 1140 level when the bulls attempt to take it back above the 1120 1220 level. 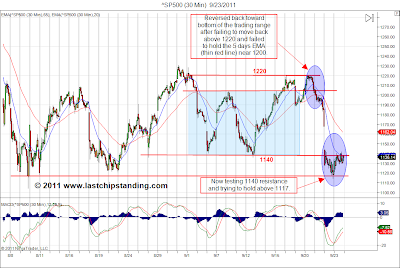 In the last trading session, the bulls finally were able to push above the 1120 1220 level once again. If the bulls can hold the SP500 above the 1120 1220 and move it beyond the 1130 1230 level, the head & shoulder baseline of 1260 could be the near term upside target once again. 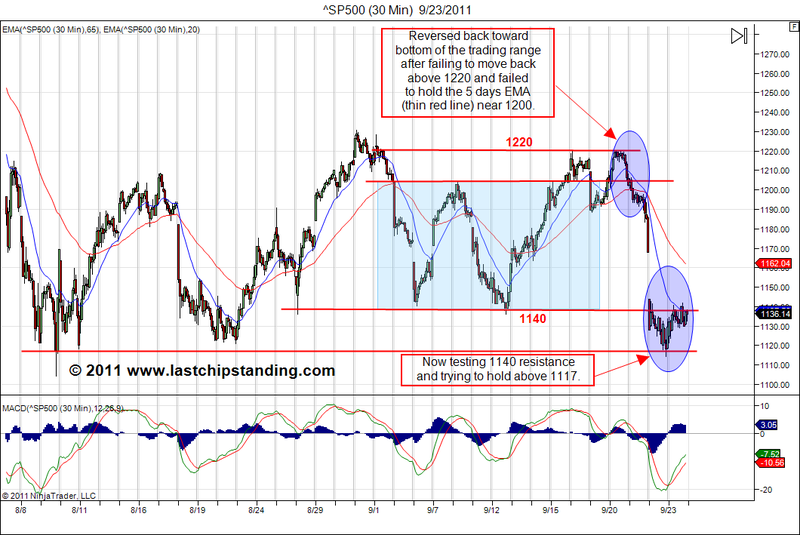 The SP500 has been chopping around within a range of 1120-1220 and it appears went nowhere. But if one look at various sectors within the market, one could sense the market’s characteristic is changing, at least for the near term. This change does not imply the market is reversing direction and heading toward a new bull trend. 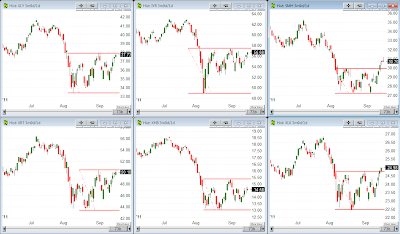 But the price actions of the sector ETFs shown on the following chart are signaling a possible near term rally could be in the offing. Unless something unexpected happen in the Euro zone, the market appears to have adjusted to whatever will most likely to occur. 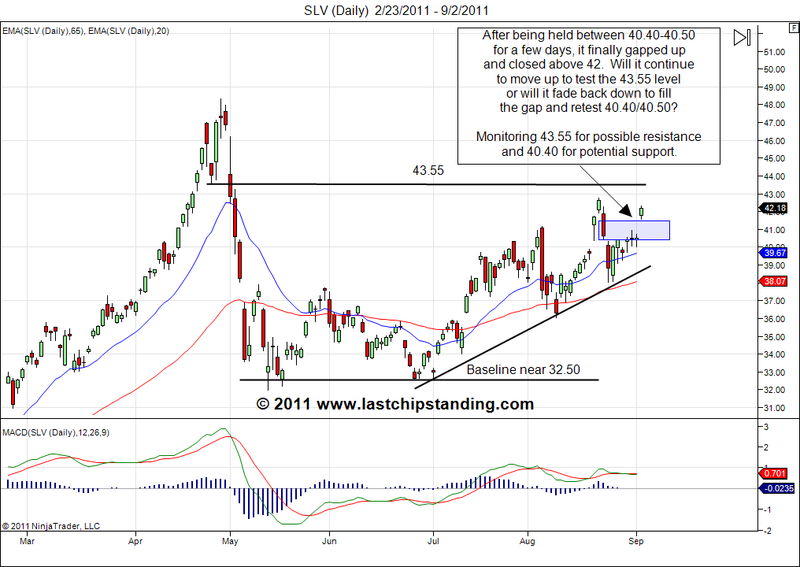 New High Coming For Gold & Silver? 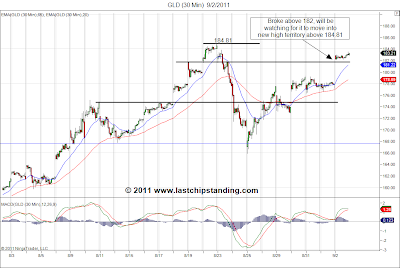 Gold and silver held their ground after gapped up during the last trading session. 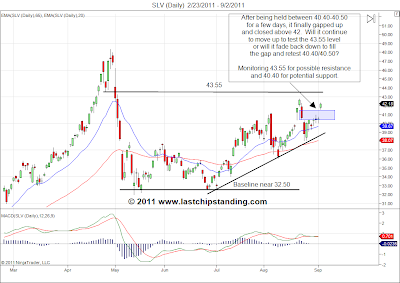 There could be some retracement before they make an attempt to a new high.